Paul van Reenen, owner and creator of Unfair Lures, met with members of the SWFKAA Thursday evening at Estero River Outfitters to present some of his new products for 2013. The clinic was part of the SWFKAA member seminar series that has so far proven to be very successful. 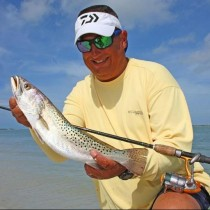 Paul started the clinic on the scenic Estero River and showed the participants some of his lures in action. Highlighted were the Rip and Slash minnow lure and the suspending Shrimp. Various presentations and characteristics were discussed until darkness fell and the meeting continued in the bait shop. Paul is an Engineer from South Africa and is very passionate about fishing. It shows in the details of the lures he designs. After a hour and a half presentation, Paul answered a few questions from the group. At the end of the event, Justin Stuller from Estero River Outfitters officially offered Unfair Lures for sale and the group nearly bought all the stock! I bought three for testing purposes and I look forward to reviewing them in great detail very soon. A special thanks to Preston Haytac for bringing us Paul, and to Esteban Gutierrez for setting up the seminar. And also to Justin Stuller for letting us hang out at ERO after hours!